Lying at the heart of this volume is the web’s enticing appeal, but as yet essentially unrealized potential, as the ultimate corpus around which text-based studies of English can be shaped. 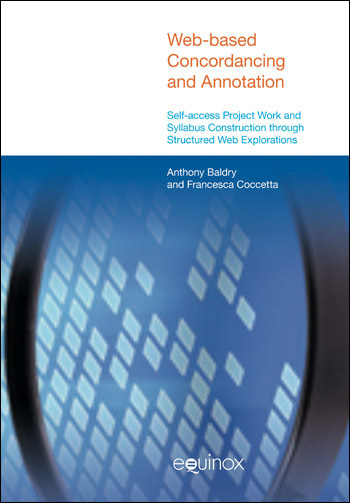 Key words in this volume are thus web-based text analysis, structured web explorations, ready-made syllabus, focus on e-learning, step-by-step self study, teacher training, development of realistic web-based syllabuses, multimodal concordancing and annotation. As the subtitle indicates, the volume addresses the needs of teachers and students who want to frame text studies in English around the web but need a ready-made guide as to how this can be done. Rather than attempting to adapt traditional language-only concordancing and annotation tools and techniques to web-based studies of English, the volume presents software tools and text analysis techniques which sideline the traditional focus on lemma-based characteristics of corpora; it refocuses attention on an integrated and multimodal model of annotation, concordancing, and web analysis techniques – all of which is particularly useful when analysing web genres. The volume’s starting point is an awareness of the need to adapt research on web analysis, concordancing and annotation into a self-access and/or classroom-learning syllabus, whence the volume’s incremental articulation as a series of steps which, as explained in the Introduction, correspond to 2-hour lesson units that build up into a 30-to-40 hour ready-made course responding to the requirements of English language learning and teaching in a wide range of degree courses (e.g. Foreign Languages, Communication Studies, Law, Psychology and Political Sciences). The volume contains descriptions of web concordancing and annotation techniques, illustrations of their application and guided exercises as well as insets providing suggestions for teachers and students on how the resources presented in the book might best be used. The volume is also supported by a website with links to the software tools described, plus additional exercises and materials, many using the McaWeb web annotation and concordancing system (mcaweb.unipv.it).